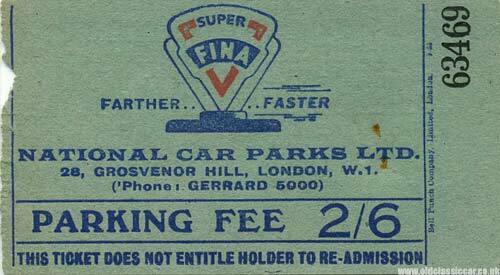 A National Car Parks ticket advertising Fina fuels. Homepage. This page: Dating to the mid 1950s, a ticket issued by a parking company situated in Grosvenor Hill, London. Snippets like this, relating to motoring years ago, are some of the hardest things to find. Intended to be thrown away after just one use, items such as this parking ticket rarely survive unless for some reason they are chucked into a drawer, or they fall down the back of a cupboard. This ticket was issued by National Car Parks Ltd, presumably the London-based company who managed the car park in question. Their offices were at 28 Grosvenor Hill in London, although quite where the car park itself was isn't known. Cost for parking - two shillings and sixpence, presumably for the day? Small text to the right of the parking ticket advises that they were printed by Bell Punch Limited of London. There is also a blurred date code - which looks like 9-35 or maybe 9-55. The ticket carries advertising for Super Fina petrol, with an illustration of a Super Fina petrol pump globe. If the style of globe can be dated, then there's a good chance that the design of the ticket can be dated too (1935 or 1955?). In addition to petroleum spirit, Fina could supply all manner of other motoring consumables, one example being Fina Thermidor Antifreeze.